Carrera Cup Germany stopped at the Norisring in Nürnberg. 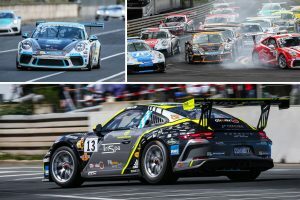 The only city racing course in the racing calendar of the Carrera Cup provided for action-packed races within the scope of DTM. Our partner raceunion Huber Racing wanted to gain ground in the fight for the championship with top driver Michael Ammermüller. In Saturday’s race, Ammermüller unfortunately made a jump start, which resulted in a 10-second time penalty. This meant only the seventh overall ranking despite a faultless race. In the second race on Sunday, Ammermüller had a technical defect, which resulting in premature failure. It was a better weekend for raceunion Huber pilot Ryan Cullen, who finished on a strong sixth overall position in the opening race. He also showed his talent in the Sunday race and finished the race on ninth place. Also the B-pilots of the raceunion Huber Racing team had every reason to be pleased. Wolfgang Triller was able to take the sole lead in the B-ranking by means of two victories in the Gentleman class. The Dutchman Wolf Nathan also showed a solid performance. Rank three and four sufficent for the fifth position in the B-ranking. Rookie Henric Skoog celebrated his premiere at the Norisring and that was quite successful. Overall rank ten and eleven mean third position in the rookie ranking. The next race will take place from 14.07. – 16.07.2017 at the Nürburgring.